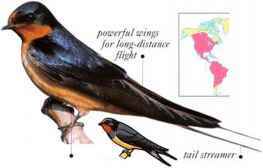 I his dark swallow blue Hies over a variety of sheen on open habitats, hunting upper insects in the air by "0«y • gliding in circles, w ith periods of flapping flight. • NEST Tree holes lined w ith mud and sticks, often in nest boxes in east of range. • DlSTRIBl 1TION Breeds in I SA. Winters in S.E. Brazil. 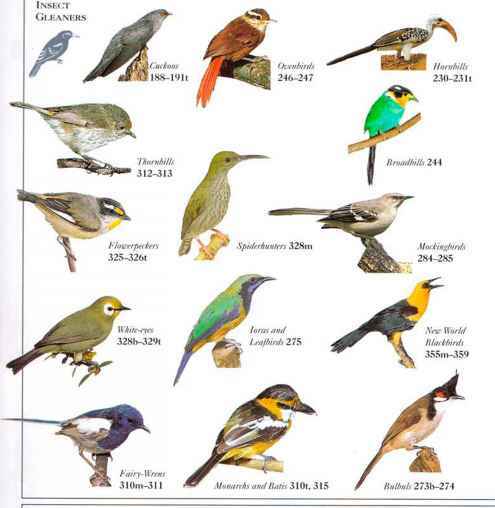 • Distribution Breeds in North America and Eurasia. Winters iu South America, Africa, N. India, and S.E. Asia. 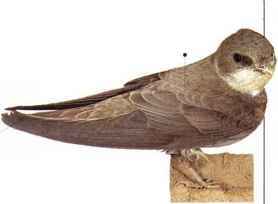 A small, drab, swallow, this species hunts insects by rivers, for long-distance flight lakes, and sand pits near its nesting colonics. • Nest a Clip nest is built of plant materials and feathers in a tunnel in a bank or cliff. A familiar seasonal visitor in tlie Northern I lemisphere. 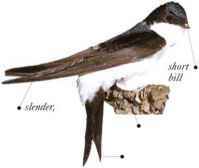 this bird frequents open country near water, catching insects in the air, often in low flight. • NEST A mud bowl built onto a small support on the wall or the roof of a building or cave.